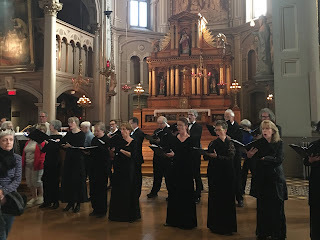 Musica Orbium, under the direction of Patrick Wedd, treated audiences to some stunning vocal performances at two performances of their concert "Extravagance Polyphonique" at the Église du Gesù last Sunday, April 17. The program, based around the illustrious motets Spem in alium by Tallis and Ecce beatam lucem by Striggio, also contained lesser-known gems, including works that predate the aforementioned motets such as Johannes Ockeghem's Deo gratia à 36 and Josquin des Prez's Qui habitat in adiutorio altissimi for 24 voices, as well as contemporary works including Patrick Wedd's Nines₂, composed for Musica Orbium's tenth anniversary, and Gregg Smith's Sound Canticle on Bay Psalm 23. Audiences enjoyed a significant degree of immersion, as they were not only physically surrounded by the choristers for certain pieces, but also invited to sing "in the round" themselves as Wedd turned to direct the audience in two- and four-part performances of Frère Jacques to illustrate the effect prior to conducting Knut Nystedt's Immortal Bach, a piece for 12 voices based on the first eight measures of Bach's Komm, süsser Tod and exploring the timbral possibilities contained therein. Audiences were also invited to stroll amongst the choristers at the end of each act, during reprises of Ecce beatam lucem and Spem in alium, in order to better appreciate the complexity of the harmonic textures created. In Queene Elizabeths time there was a songe sent into England of 30 parts (whence the Italians obteyned the name to be called the Apices of the world) which beeinge songe mad[e] a heavenly Harmony. The Duke of ______ bearing a great love to Musicke asked whether none of our English men could sett as good a songe, & Tallice beinge very skillfull was felt to try whether he would undertake the Matter, which he did and mad[e] one of 40 p[ar]ts which was songe in the longe gallery at Arundell house which so farre surpassed the other th[a]t the Duke hearinge of the songe tooke his chayne of gold from of his necke & putt yt about Tallice his necke & gave yt him. Alessandro Striggio, who was a diplomat as well as a musician, visited London in 1567; it has been suggested that he carried with him the music for one or both of his aforementioned works and that this visit sparked the inspiration for Tallis' Spem in alium, which was composed around 1570. Ecce beatam lucem, however, originally called for instrumentation to accompany the four choirs; a 1568 performance included eight flutes, eight violas, eight trombones, harpsichord and bass lute. Wateridge's anecdote (and its connection to Striggio) nevertheless has its critics. The letter does not refer to Striggio by name, and if Wateridge does mean Ecce beatam lucem, the "30" must be a misprint. The letter was also written almost 40 years after the events discussed would have occurred. There is evidence to suggest that Spem in alium was in fact composed under the reign of the Catholic Queen Mary, Elizabeth's predecessor. The original Latin text of the motet is drawn from Catholic liturgy -- specifically from the Old Testament Book of Judith, a biblical figure to whom Mary was often compared by court iconographers. Other historians have even suggested a later composition date for Spem in alium, suggesting that it was first performed in 1573 for Queen Elizabeth I's fortieth birthday. A further connection in the program is the inclusion of the des Prez and Ockeghem pieces. While Josquin des Prez (c. 1450/1455 – 1521) was the first master of the high Renaissance style of polyphonic vocal music featured throughout "Extravagance polyphonique", he greatly admired and may have even studied under Ockeghem (c.1410/1425 - 1497). The high point of the concert, however, may have been Gregg Smith's Sound Canticle on Bay Psalm 23. Based on the 1698 Bay Psalter, this piece made the most effective use of the singers' positioning around the audience to create a "spatial psalm". Each phrase of the original psalm is performed by four soloists at the front of the hall, and is echoed and transformed by the choir singer by singer, creating a sweeping sound that serves as a phenomenal demonstration of the capabilities of vocal music.